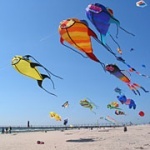 Plenty of Michigan kites are showing up at the beaches during the summer months. The kites of today are so different from the ones I grew-up with. Neat, sleek, designs and colors are what you'll find now. More kite festivals are starting to show up and these folks take kite flying seriously. These events draw competitors from all over the country. I never realized you could get a kite in so many designs and wild colors. Some of them are huge and require great strength and skill to manuever. You will be amazed at the tricks and stunts their operators can perform. You will see three levels of competition. 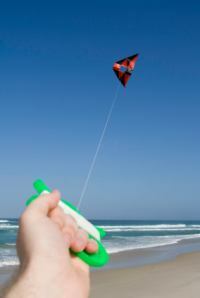 The Fun Fly is what we every day kite flyers can participate in. The Sport Kite and Fighter Kite Competions are for the big boys. Here are two kite festivals we are aware of. If you know of any others along Michigan's west coast contact us and we will add them for our viewers. From Michigan Kites back to Lake Michigan Attractions.